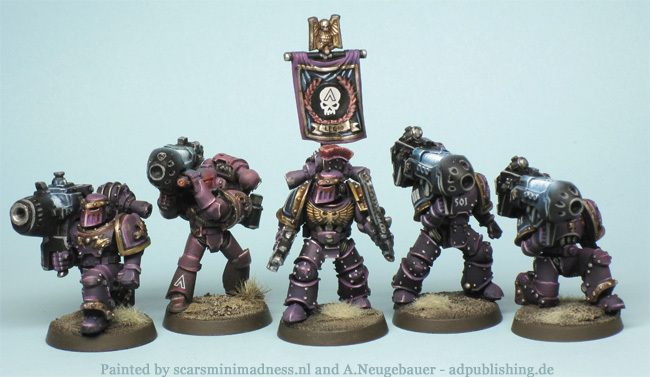 The way they are presented in the Heresy novel is a different thing, very much to my liking. A warrior brotherhood sworn to achieve martial perfection with a vain leader who constantly is doing the wrong thing out of often good reasons. 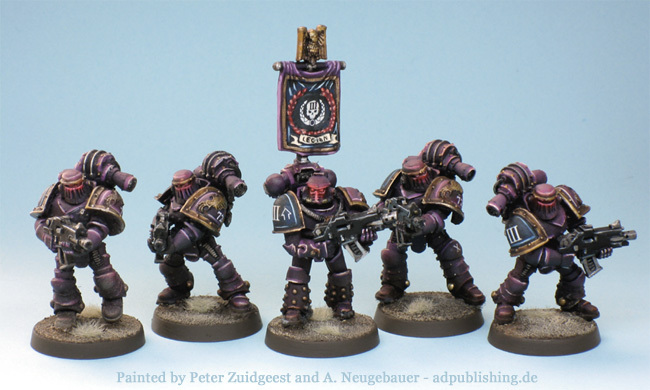 So when the opportunity was there to get a decent painted Heresy style EC army, I had to jump at it. 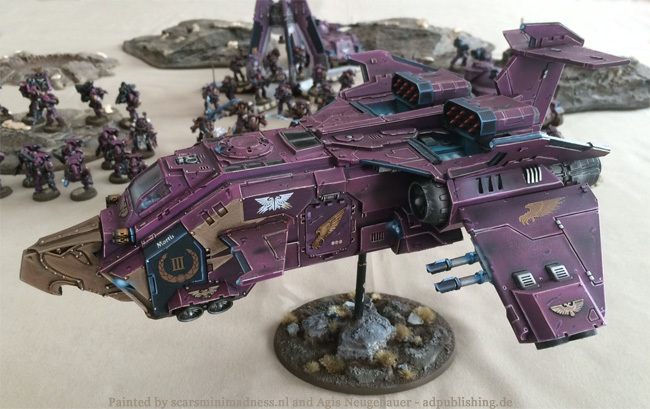 So when Peter Zuidgeest of Scars was selling his army we quickly reached an agreement, roughly 2/3 of his force was sold to the US and I took the rest. 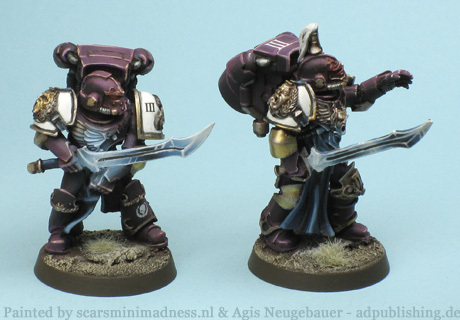 As you can see the minis are very nicely done with some cool Source lightning effects. But still I wanted to change something. 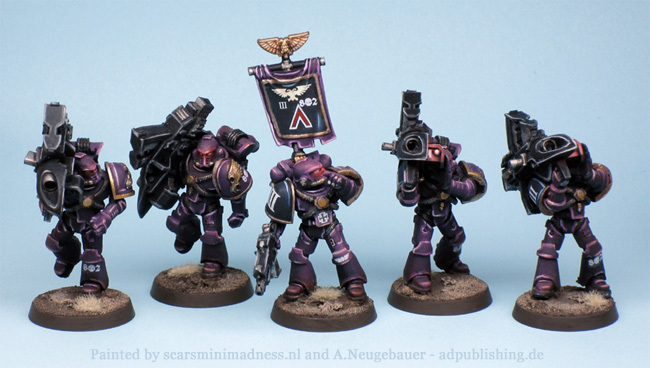 The freehand numbering is a bit sloppy IMO for a Legion so vain. The bases are IMO a bit too distracting for rank and file trooper. So I changed the minis to look like the mini below. Only a subtle difference, but more to my liking. And as strange as it sounds - now it is really MY mini. So within the next weeks you will see some more EC from me! 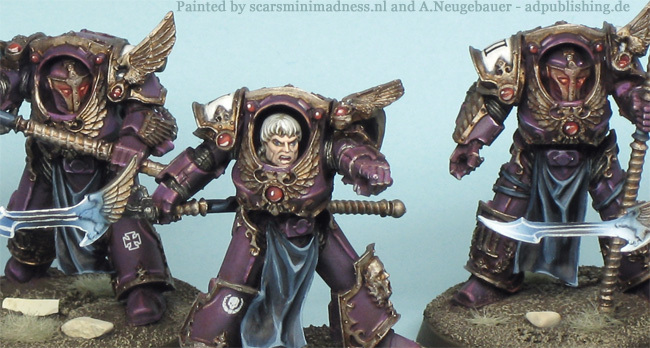 The Emperors Children Palatine Blades. The usual collaboration of Peter and me. 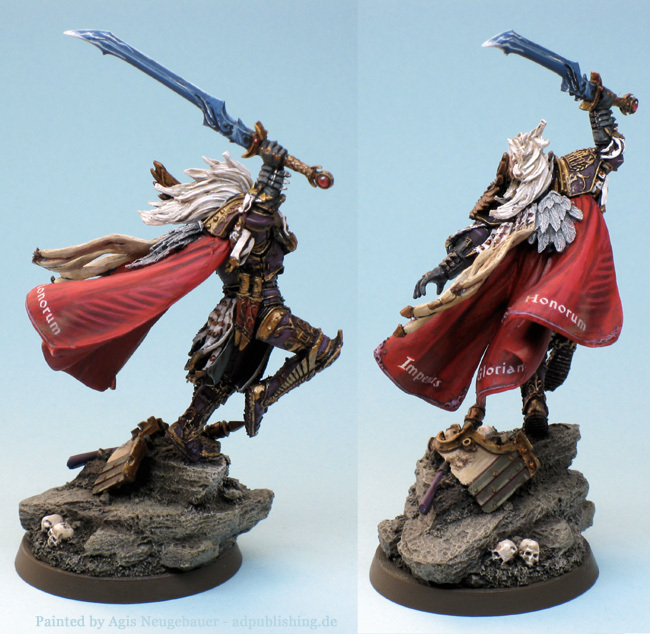 The large Power sword below was repainted by me, all the rest are the above describes modifications. 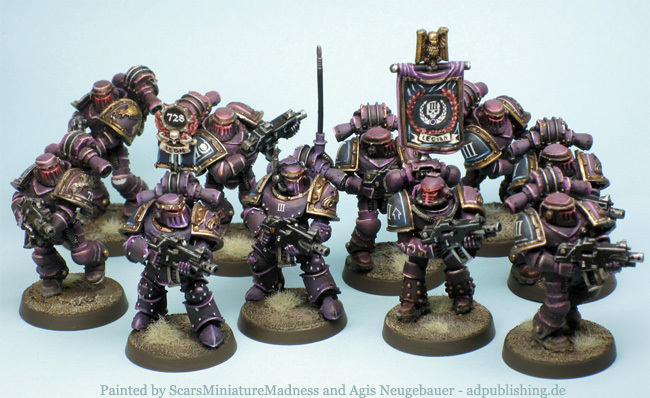 The Emperors Children Assault Squad. Again a collaboration of Peter and me. 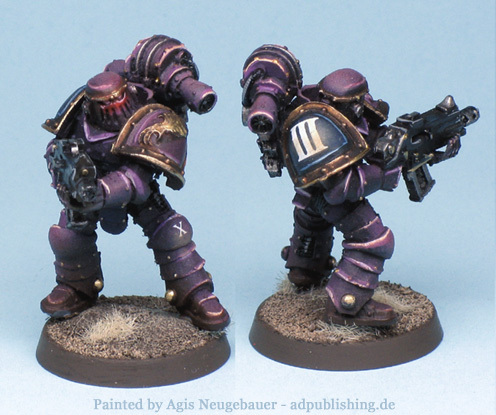 The Emperors Children Phoenix Guard Terminators. The usual collaboration of Peter and me. 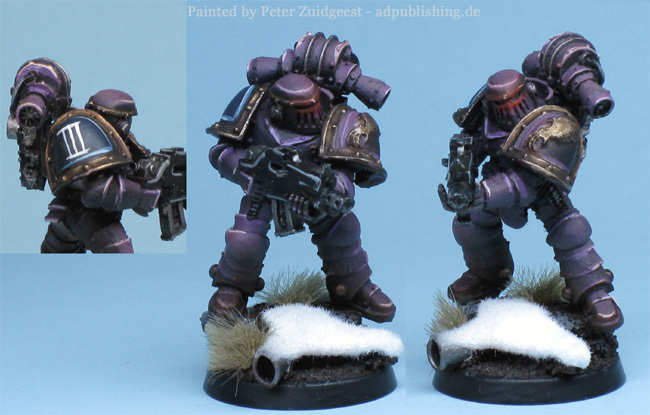 The head of the squad leader is painted by me, all the rest are the above describes modifications. 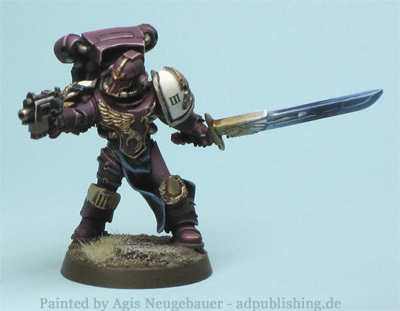 The Emperors Children Legion Champion in his Mk IV Armour, Iron Halo and Jump Pack. 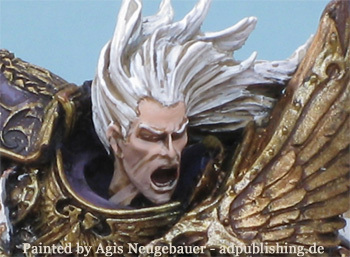 I only had to retouch the hairs, some highlights here and there, apply the transfers and paint the base. 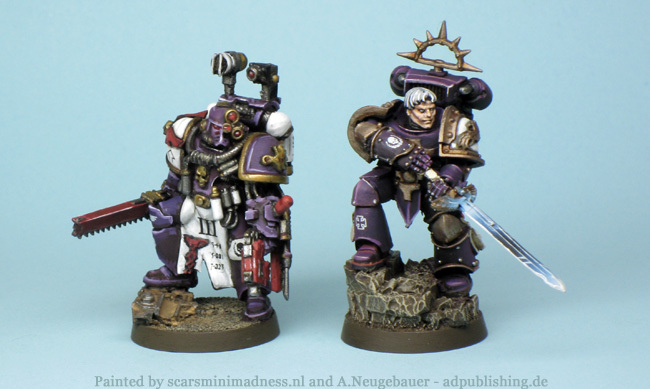 The Emperors Children Legion Champion together with my Apothecary Crassus. Works well for me. 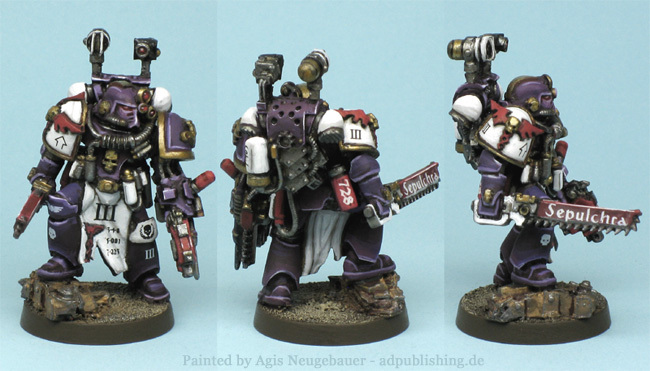 Apothecary Crassus in his Mk IV Armour, please note the squad number “728” on the Geneseed tube. Crassus is currently assigned to Tactical Squad 728. 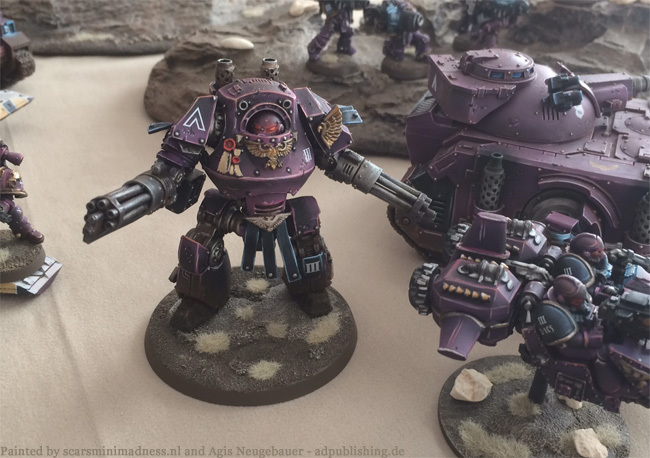 And the effect of the “Agisfication” on a Heavy Support Squad. 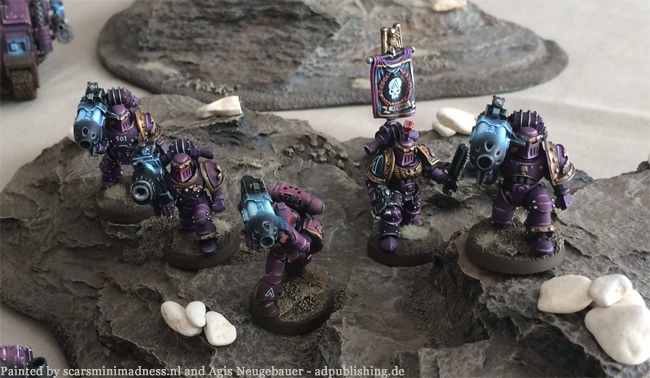 Again bases changed, transfers applied, banner repainted, metal effects added, some retouches here and there. BTW - I have to say that Peters Light effects are absolutely top notch, he even takes into account that the targeting system of the 2 running Marines are still unlit! Very nice details and clever posing. 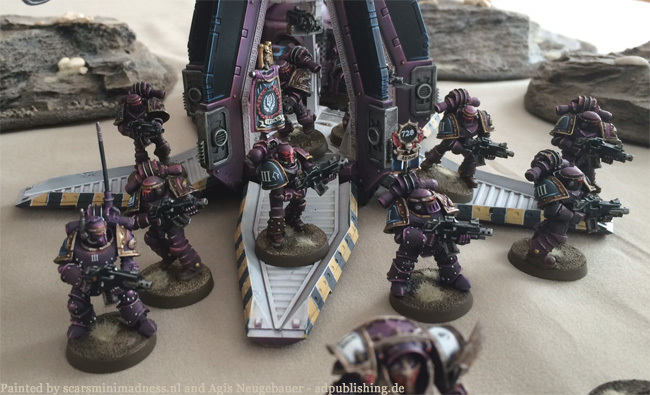 Again the effect of the “Agisfication” on a Heavy Support Squad. 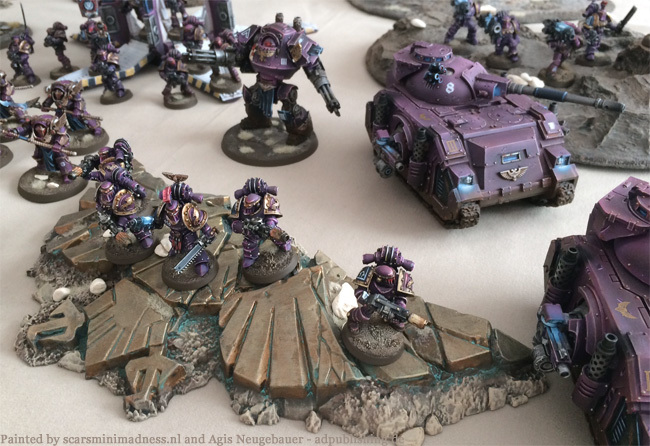 Again bases changed, transfers applied, banner repainted, metal effects added, some retouches here and there. 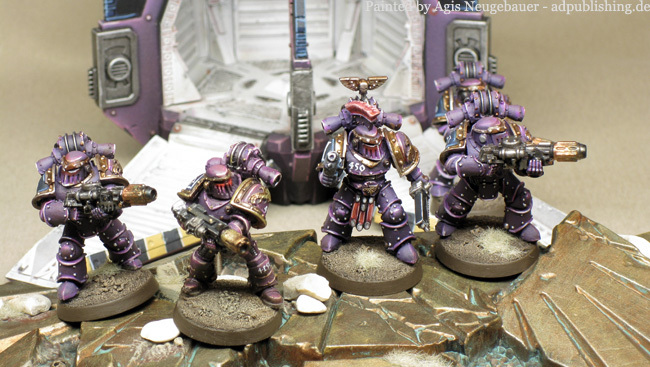 The legs of the kneeling Marines are from Anvil Industries. 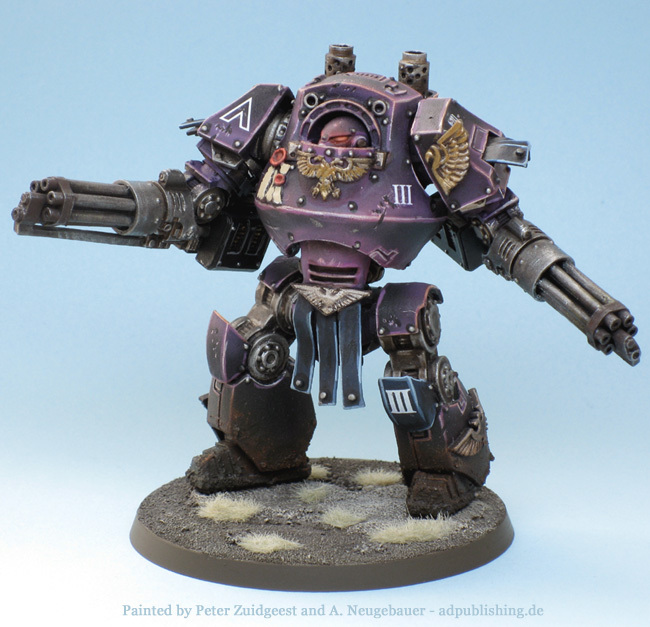 Same treatment for a Contemptor. Bases changed, transfers applied, metal effects added, some retouches here and there. 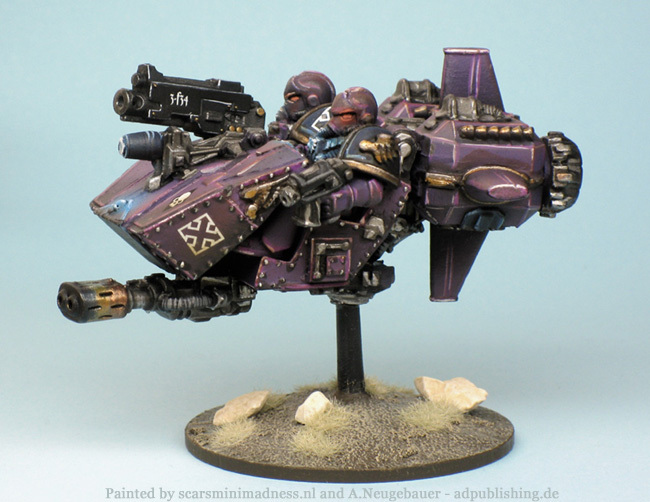 From all 3 versions of the Marine Land Speeder I always like the chunky full metal 2nd edition one the most. Since I still had one around I bribed Peter to paint one for me. 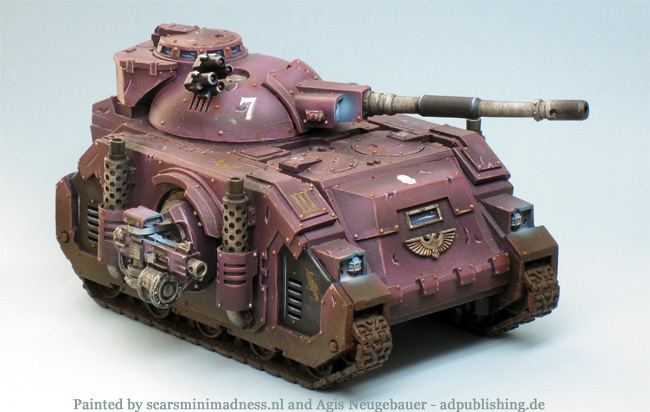 Splendid work from him as usual, I only had to apply some transfers do some more weathering and the basing. 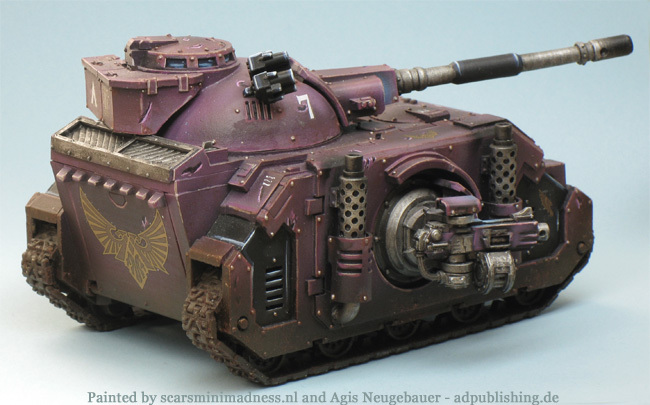 The original Flamer broke off during transport which pushed me into the right direction to mount and paint a Heavy Bolter. 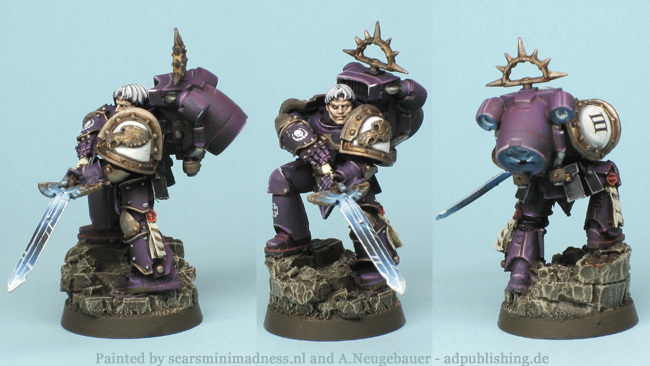 OK, on to Fulgrim, not only one of my favourite Primarchs, the FW mini is just too good to be missed! 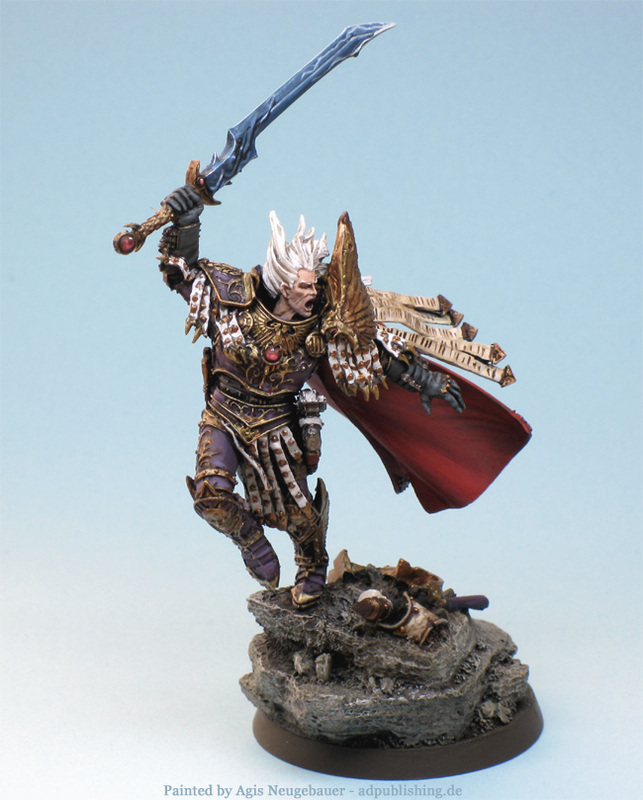 Forge World Fulgrim. 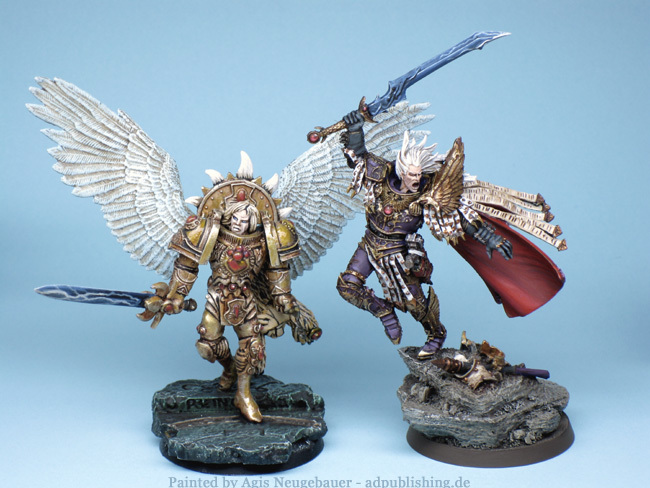 Aftermarket Sanguinius. 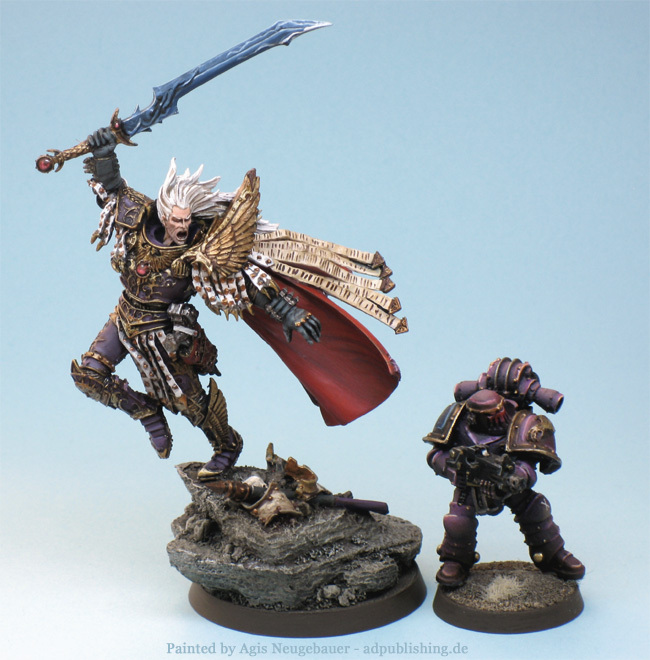 The mini is sculpted (probably) by Scibor. I bought the minis quite cheap from a guy in Russia. 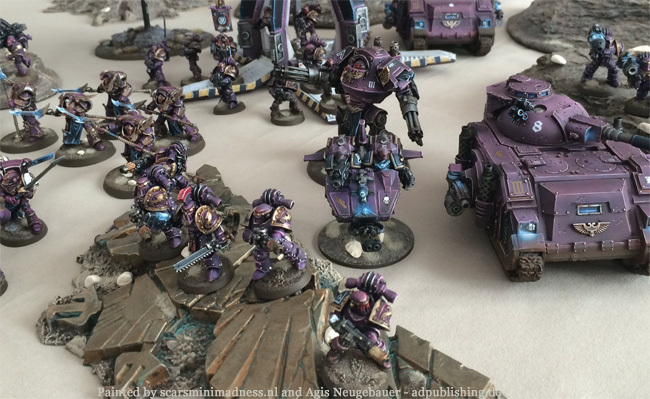 WIP - Tactical Support Squad. 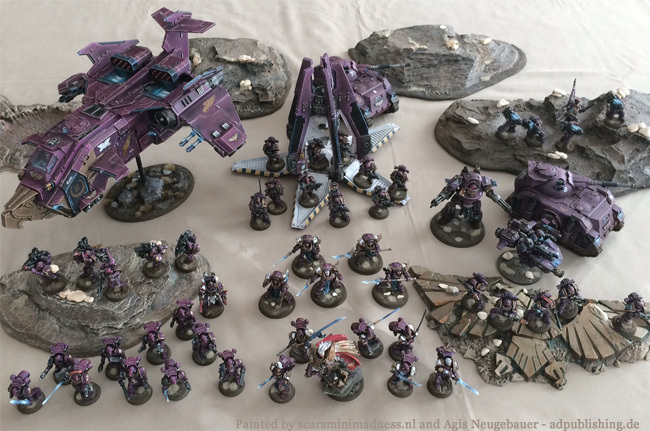 Peter sold me a 10 Marine Tactical Squad using the 40K Codex. 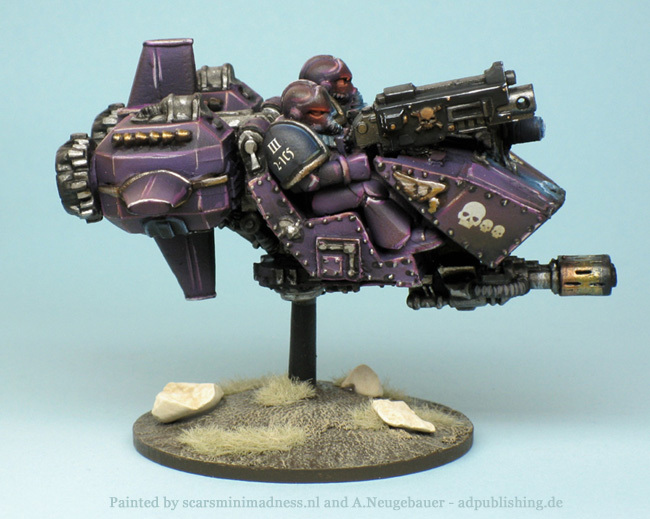 Consequently he included 1 Meltagun and a Heavy Plasma Cannon. 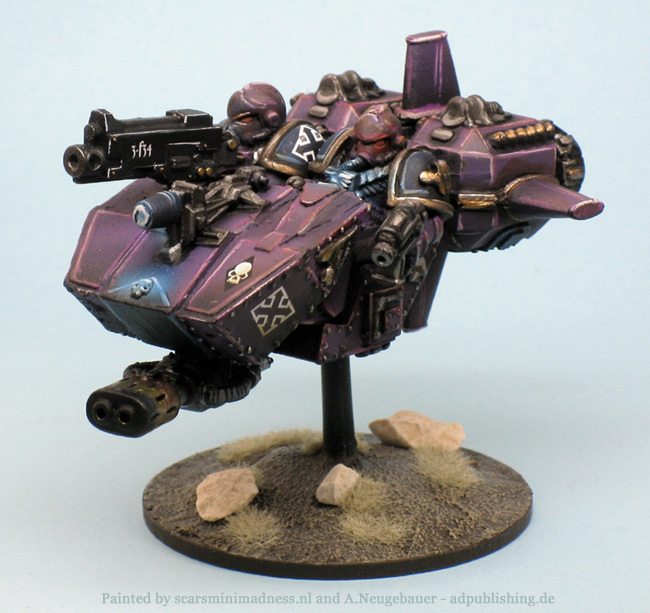 The melta Marine is the nucleus of a Tactical Support Squad. 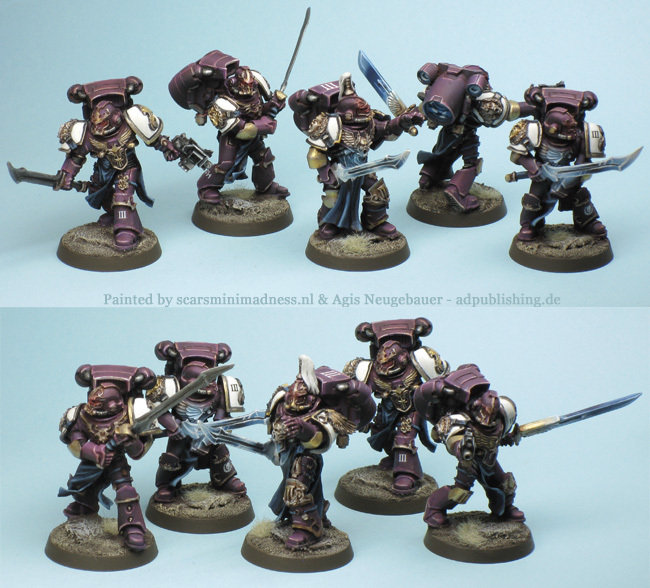 And done - Tactical Support Squad.